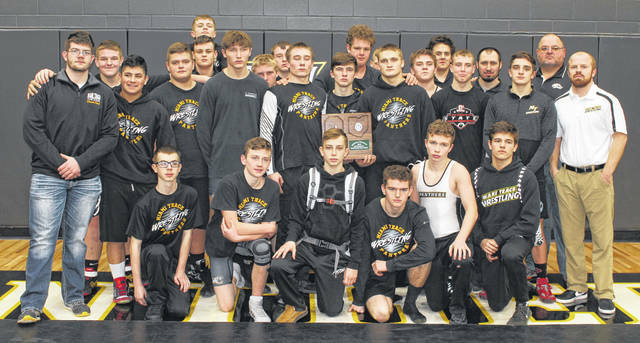 The Miami Trace Panthers were Regional runners-up at the dual team tournament held at the new Miami Trace High School Saturday, Feb. 2, 2019. James Munro of Miami Trace wrestles an opponent from Clinton-Massie in the quarterfinals of the Division II Region 14 dual team tournament Saturday, Feb. 2, 2019 at the new Miami Trace High School. Washington’s Collier Brown wrestles an opponent from Gallia Academy at 195 pounds at the Region 14 dual team meet Saturday, Feb. 2, 2019 at the new Miami Trace High School. Miami Trace’s Jayden LeBeau wrestles his Clinton-Massie counterpart at 152 pounds Saturday, Feb. 2, 2019 at the new Miami Trace High School. The official raises the arm of Washington’s Will Baughn after Baughn won a match at 145 pounds against Gallia Academy in the Region 14 dual team tournament Saturday, Feb. 2, 2019 at the new Miami Trace High School. Miami Trace’s Storm Duffy trailed 10-1 in his match against Clinton-Massie at 126 pounds Saturday. Duffy battled back and tied the match in the final seconds of regulation. Duffy won the match, 11-10 in overtime. Washington’s Dylan Moore (at right) faces off against an opponent from Gallia Academy during the Regional dual team tournament at the new Miami Trace High School Saturday, Feb. 2, 2019. 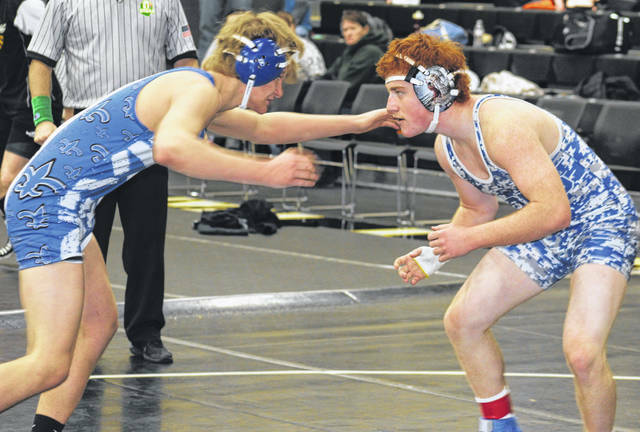 The Miami Trace Panthers wrestling team was looking to qualify for the third year in a row to the State dual team tournament at St. John Arena on Feb. 10. The Panthers hosted 13 other teams for the Region 14 Division II tournament, the first sporting event in the new high school, Saturday. Miami Trace was the No. 1 seed and London was seeded No. 2. Those are the two teams who battled their way to the championship match Saturday afternoon. In that dual, London defeated the Panthers, 47-24 to qualify to State. Miami Trace had a first-round bye and faced Clinton-Massie in the quarterfinals. The Panthers defeated Clinton-Massie, 55-18. For Miami Trace against the Falcons, Weston Melvin (113), Storm Duffy (126), Graham Carson (132), Mcale Callahan (138), Jayden LeBeau (145), James Munro (160), Ashton Curtis (182) and Grant DeBruin (285) had pins. Dylan Arnold (170) had a 12-2 major decision over Braxton Green. The Washington Blue Lions began by facing Gallia Academy. The Blue Lions won this dual match, 45-22. For Washington, Branton Dawes (113), Will Baughn (145), Jay Fettig (160) and Dylan Moore (170) had pins. Collier Brown (195) won a 3-1 decision over Lane Pullins. Washington faced London in the quarterfinals and London won, 62-17. 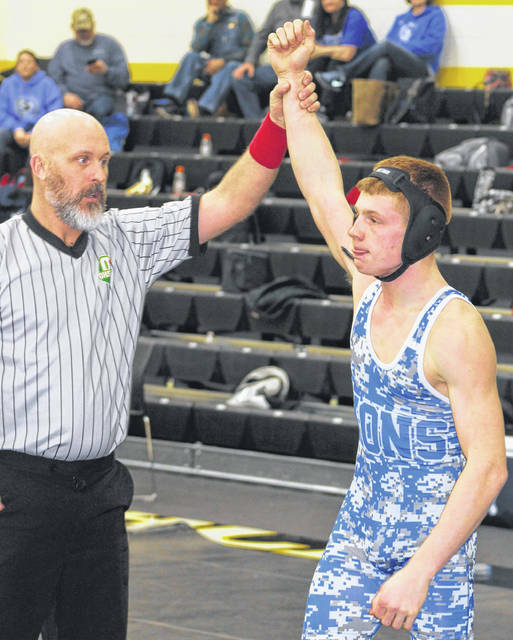 For the Blue Lions, Dawes had a pin, Collin George had a pin at 120 pounds and Moore won a 21-4 technical fall over Garrett Weldon. 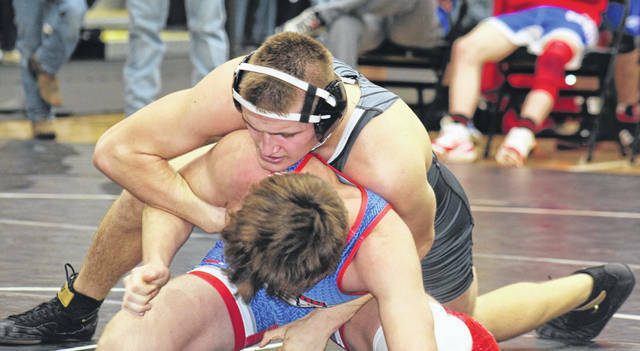 Miami Trace faced Logan Elm in the semifinals and won that match, 39-33. Duffy, LeBeau and Munro picked up pins for the Panthers in this match. Melvin won a 14-0 major decision over Cole Renier; Callahan won 7-1 over Peyton Bennett and Arnold won 7-5 over Luke Hinton. London defeated Athens in the other semifinal, 42-30. In the finals for the Panthers, Melvin, Kylan Knapp (138), Munro and DeBruin won their matches by pin. London also won four matches by pin, one by forfeit and five by decision. “Our coaches did a lot of research,” Miami Trace head coach Ben Fondale said. “We knew London was going to be really tough. They have a really good squad over there. Coach (Richard) Burns is doing a great job. “I’m glad we got a chance to wrestle them,” Fondale said. “It didn’t turn out the way we hoped. My guys wrestled hard and showed a lot of heart. I want to thank my wrestlers, my coaches and the fans for coming out and supporting us. “Clinton-Massie gave us a pretty good match the first time we faced them,” Fondale said. “We knew we’d have to bring a good level of intensity to beat them again. 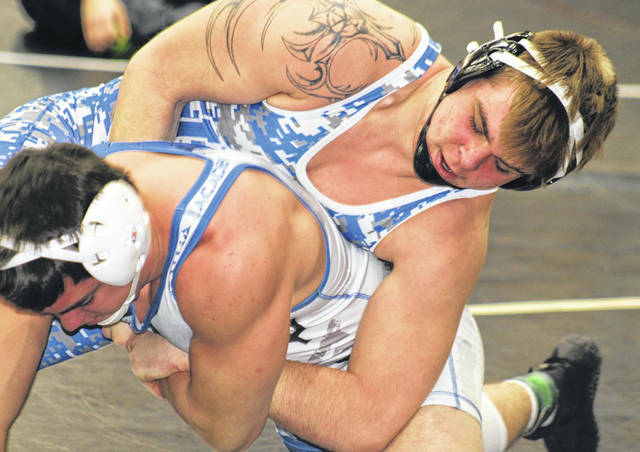 “Gallia was giving up some weight classes and so were we,” Washington head coach Louis Reid said. “We won that match, but we looked sluggish. “In our second match we had the No. 2 seed, London,” Reid said. “They’re 10-0. I’m not happy we lost, but London is a pretty good team. We knew it would be tough going in. “My guys wrestled much better,” Reid said. “Our kids came out and had some quality matches that will help prepare us for the postseason. The new format is pretty awesome, it makes it more intense, I feel. London will be seeded No. 8 at the State tournament and will face the No. 1 seed St. Paris Graham Sunday at 11 a.m. The FAC meet is Saturday beginning at 10 a.m. at Chillicothe High School.